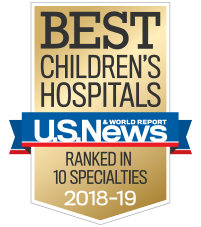 Your child and your family can take comfort in knowing that we are ranked among the top 10 pediatric nephrology programs in the country. Children's is home to one of the leading pediatric nephrology programs in the country. Combining the latest proven technology and research with a caring, child-friendly approach, makes Children's a top choice for the treatment of common and complex kidney conditions. We have 10 full-time pediatric nephrologists who have more than 100 years of combined experience. We are ranked as one of the top 10 pediatric nephrology programs in the U.S. by U.S. News & World Report. We are home to one of the largest pediatric kidney transplant programs in the country and the largest in the Southeast. We engage in cutting edge research, including studies that have led to FDA approval for two new treatments for children with kidney disease. We are one of the largest pediatric dialysis units in the U.S., typically caring for more than 40 children receiving chronic hemodialysis or peritoneal dialysis. Comprehensive, family-centered care for children with decreased kidney function. Treats children who have potential medical complications from chronic kidney disease, such as anemia, bone disease, high blood pressure and poor growth. Prepares children for dialysis and kidney transplant, when necessary. Delivers quality medical care while addressing the psychosocial needs of our patient families. Allows patients to see a full range of our CKD experts during one clinic visit. Call 404-785-1119 to make an appointment. We require a physician referral. Our unique, multidisciplinary approach to care has made our clinic one of a few of its kind in the Southeast. Led by Donald Batisky, M.D., the Hypertension Clinic at Children’s provides comprehensive care to infants, children and adolescents who have high blood pressure. Our team includes pediatric nephrologists, a registered nurse and a nutritionist. The Children's Carlos and Marguerite Mason Transplant Center provides full pre- and posttransplant services for children who need a kidney transplant. A kidney transplant provides your child with a healthy kidney from a donor. There are two main types of kidney transplants, a deceased donor transplant and living donor transplant. A deceased donor transplant provides your child with a kidney from a person who has recently died. To receive a deceased donor kidney, you child is placed on the UNOS list. A living donor is a person who volunteers to give your child one of his kidneys. The donor's remaining kidney works well enough for him to have a normal quality of life. Your child's new kidney takes over the work of two failed kidneys. In conjunction with Emory University School of Medicine, our nephrology team is committed to excellence and innovation in pediatric kidney research. We are devoted to developing new and better preventive, diagnostic services and treatments through research. We invite families to attend camp giving them the opportunity to have fun, meet others with similar conditions and build confidence. Camp Independence: A weeklong summer camp experience for children and teens, ages 8 to 18, who have been diagnosed with kidney disease, are on dialysis or have received an organ transplant. Second Chance Family Camp: A weekend camp that allows transplant recipients, candidates and their immediate family members to enjoy camp activities with others who share similar experiences. Chronic kidney disease and pre- and post-kidney transplant clinics are held at Emory Children’s Center Building, while general nephrology and hypertension clinics are held at our other neighborhood locations.